Harley is really the star here, and she gets more character development than she did in the entire original series. I think it made me really understand her character a lot better, and even feel some empathy for her. Harleen Quinzel is smart and funny, but her acting out her hostility towards society is strictly a function of frustration endemic to her blue-collar roots, which is only really made obvious in this film, not in her prior appearances in Batman animated episodes. The way she talks and various clues to her upbringing that she drops make that clear, and as a result she's the exact antithesis of the typical "classy" femme fatale villainess. At one point she makes Batman stop the Batmobile, then leaps out and chases and starts beating up on a guy that she spotted, who once dated and then dumped her, yelling at him "You made my mother cry!". 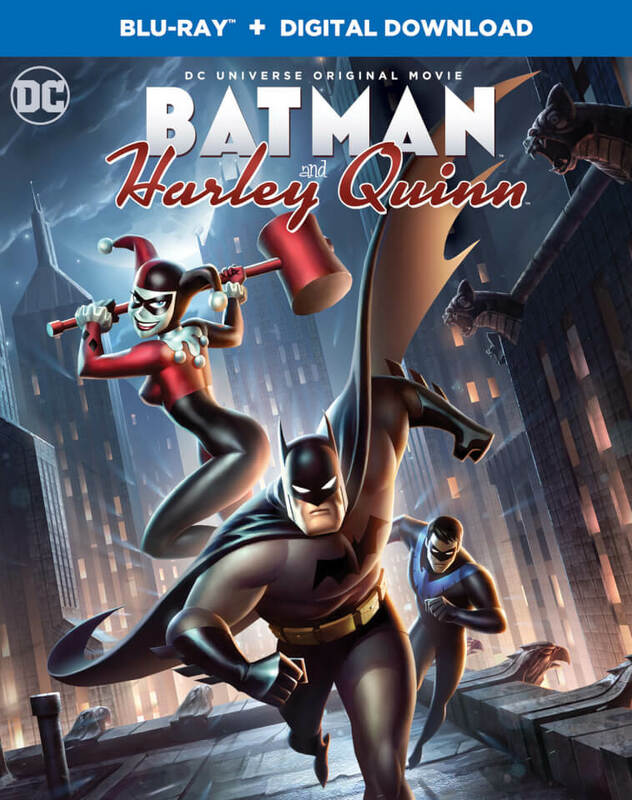 In this movie, Harley really is sincere in trying to reform, and helping stop Ivy's crazy plan to turn everyone in the world into plant-creatures, but she's angry because of the lack of trust or respect she's getting from Batman & Nightwing in return for her efforts, and you start to get the point that that's really her whole life-story. She made bad choices in her life because she was acting out of frustration and didn't feel like she was getting any respect or recognition. Towards the end, when the situation is looking at its worst, it's down to Harley to stop her BFF Ivy from using the replicated Bio-Restorative Formula to transform every human and animal on the planet into plant-creatures, and there's what I'd call a real "Betty & Veronica moment" between the two of them. At the very conclusion, when Batman & Nightwing have exhausted all of their high-tech armament in attempting to stop the powerful Floronic Man, Harley suggests the most simple and should-have-been-obvious solution that never occurred to them. I see online where the movie got a lot of negative reactions from people who didn't like the fact that Harley wasn't voiced by original cast member Arleen Sorkin, and couldn't abide any "comical" humor in a Batman movie, while some claimed that the plot was weak. I felt like it was a nice expansion on the previously-existing character of Harley, and Melissa Rauch did a decent job of bringing her own qualities to Harley's voice. Humorless sticks-up-their-butts reviewers leveled charges of "juvenile humor", but that only indicates to me that they failed to understand the characterization of Harley Quinn. The humor present here is completely appropriate to that character, and doesn't "make fun of" Batman in any way, nor did I have any problem following the plot of the story, which made complete sense to me. Other than that, it's sort of a traditional Scooby-Doo mystery plot (the gang has to help KISS stop The Crimson Witch from haunting their amusement park, KISS World) apart from the fact that the science-fantasy/cosmic dimension aspects can't be explained away (although Velma does so anyway, because that's her schtick). There's some varying quality of different animated sequences (from excellent to average), and when the Crimson Witch gets ahold of the Black Diamond and uses it to summon "The Destroyer", he's like a Jack Kirby-esque floating head that's kind of an amalgamation of Galactus/Darkseid/Modok. I haven't watched a lot of the Scooby-Doo DTV features, but I kind of liked this one. Well, no... NOT seriously. People who had problems with the writers putting a few funny scenes into the movie are probably taking it far TOO seriously to allow the cartoon team to have any FUN. There's nothing in here that's mocking the characters, and it's exactly the sort of humor that's characteristic of Harley. Relax and just roll with it. Geez, somehow people can accept the idea of a nightclub/bar where ALL the criminal henchmen (and women) gather to party... but throw in a scene where one of Catwoman's henches tries to razz Batman by doing the batusi (and gets dropped by a quick & casual suckerpunch from Batman for his trouble), and all of a sudden, THEN it becomes too unreal to deal with. Yeah, because all the rest of the things that appear in a DC cartoon are so realistic and believable. And yeah, the expectation that Swampy was going to put in an appearance was there the minute they mentioned Alec Holland. That being the case, we'd have been disappointed if he didn't -- and also if he just showed up at the end to provide the big deus ex machina ending (that probably should be "deus ex flora", for "God out of the plants"...) -- which would just leave us wondering why he didn't just do that in the first place, and save Batman & Harley all the trouble. Swamp Thing was always aware of what Ivy and Woodrue were doing from the very beginning, because they're all connected to The Green, except that Ivy & Woodrue have no conscious awareness of it, until they eat those mind-altering yams that sprouted out of Swamp Thing's body (which is a type of Holy Communion with the Savior of the Green). Having Swamp Thing just wave his hand to make the problem go away (by turning Woodrue into a stump, like Harley suggests) would have been a cheat -- WAY too easy a resolution. If it's not down to Batman & Harley to solve the problem, then they probably should have just made a Swamp Thing movie (which I'm sure, for commercial reasons, would have been entitled BATMAN & SWAMP THING anyway). It's a damn sight better of a movie than all of the crappy DC Universe films (13 by my count) that they've put out in the last five years. The last decent ones were Justice League: Doom and Batman: The Dark Knight Returns in 2012. A lot of these are on Netflix. Which one of these do you recommend? The list above is in their original order of release. I've rated them all from 1 to 5 stars, depending on how much I liked them. You should definitely watch the first of each series (in red), as those are both the shortest of both series (at 23 minutes), and they are definitely designed as "introductory" features that introduce the main characters and basic premises of the series. The Monster High features all focus on some different theme, and each features a slightly different cast that they focus on. Generally speaking, one or two characters tend to take the lead parts, with some new character(s) also being introduced in that feature. The first two MH features, and all of the Ever After High features, are traditional-style flat (2D) animation, while the MH features from Why Do Ghouls Fall in Love? on are all CGI animation. The characters tend to look a little different in one style to the other, and the same is true of both their appearance as dolls and the packaging art. I have a definite preference for the 2D animated characters' look. You might want to check out Mattel's YouTube channel to sample either of the short webisodes (about 3 minutes long, +/-). Just search for Monster High Volume 1 or Ever After High Volume 1. The first couple of Ever After High specials are compiled from shorter webisodes making up a continued story arc, so you can sample those for free. Boo York, Boo York is a musical and a love story. Out of all the CGI-animated MH features, it tends to work the best, because the music keeps the story moving along at a good pace. MIRACULOUS: Tales of Ladybug & Cat Noir (Season 1, 26 episodes) - What a great show. It's one of the most unusual spins on a superhero series I've ever seen (and I've seen a lot of them). A pretty girlie take on a superhero, because it's cartoony, and a high school rom-com, or maybe that should be "magical girl" + "henshin hero" instead of superheroes... or maybe it doesn't matter since the series is set in the city of Paris. Ordinary (or is she?) Parisian 15 year-old Marinette Dupin-Cheng is chosen to be the wearer of the miraculous, which grants her the magical powers of Ladybug (no sillier than being bitten by a radioactive spider, I guess). She's goofy, clumsy and tongue-tied whenever she's in the presence of her schoolgirl crush, Adrien Agreste, son of a famous and wealthy fashion designer (and himself a teenage male model)... who is also secretly her crimefighting partner, Cat Noir, unbeknownst to her. And Cat Noir has a mad crush on Ladybug, but of course, he doesn't know she's really Marinette either. There are some strong hints that the master villain of the series, Hawkmoth, may be Adrien's father (and neither hero knows that either... but does Hawkmoth know who they are?). Hawkmoth never confronts them personally, but remains safe within his secret lair until whenever he senses dark emotions of frustration, anger, and hurt and in people, and he absorbs and transforms those emotions into a dark force (because he too is the possessor of a miraculous) which allows him to imbue an ordinary white butterfly with evil power, changing it into a black "akuma" and sending it out to "evilize" a normal person in emotional turmoil (by bonding with some object in that person's possession, transforming them along with its power into a proxy supervillain) that Hawkmoth promises the power to gain revenge to, in exchange for them agreeing to bring back to him Ladybug and Cat Noir's miraculouses, their magical power objects that are said to represent the powers of creation and destruction, and together are said to be the most powerful of several known miraculouses, that have been in existence for thousands of years, and have been passed down worldwide over the centuries to different chosen ones in many different times and countries. When transformed, the heroes gain both the usual enhanced speed, strength, stamina, agility and durability, and also a signature weapon (Ladybug = magical compact/yo-yo; Cat Noir = magical battle staff) and a special "finishing move" power. Cat Noir's is "Catastrophe! ", an ability to summon dark force into the palm of his hand to disintegrate any solid object (one-time only), and Ladybug's is "Lucky Charm! ", a randomly-changed object that comes with no instructions ("What am I supposed to do with this? "), but which also includes Ladybug-vision (she sees red-and-black-spotted objects when she looks all around her that clue her into what she needs to combine the seemingly-ordinary Lucky Charm with to win the day and defeat the villain). Ladybug never knows what to expect when she shouts "Lucky Charm!" -- some of the Lucky Charms have been: a spray-paint can, bath towel, Ladybug costume, another yo-yo, a cardboard box, a spoon (all of them red, with black polka-dots). After they've chosen to use their special power, they have only 5 minutes remaining before they'll transform back to their normal selves. There's a rhythm to the ritualized repetition of certain tropes and expected actions, so that you actually look forward to seeing them in each episode. So well thought-out, funny, action-packed, and having some real emotional truth at its core. Usually I'm not a big fan of CGI-style toons, but in this one the characters are so well-designed, and their body language and facial expressions rendered with a lot of care. They're well-animated and can be graceful or goofy in their movements, according to what the situation calls for. I love it. ARCHIE'S WEIRD MYSTERIES - Watched 12 episodes (out of 40 total) of this show, and it's the first time I've really seen it. THE BAD: The character designs, the animation, the voice acting, and the horrible opening theme song. I might have rated it as typical of its time had it been made in 1989 as opposed to 1999, and even though I've owned this DVD set for years now, this is the first time I've been able to force myself to watch through an entire episode. In addition to that, there's a little over 4 hours of video (10 episodes + 1 "bonus" Sabrina episode) squeezed onto each of the 4 discs in this set, so the poor video quality due to compression doesn't help. It's no real surprise that this show wound up being dumped onto the Fox Family channel, since I'm sure none of the networks or major basic cable channels wanted to touch it with a 10-foot pole. It's pretty embarrassing by turn-of-the-millennium animated series standards. THE GOOD: Once I managed to get past all of the above and force myself through watching a few episodes, I noticed that (given the basic atypically-Archie Comics premise) the writing is actually not half-bad, certainly far better than most previous Archie Comics cartoon adaptations. The single exception would probably be the original Hanna-Barbera JOSIE AND THE PUSSYCATS season, but who knows, if the animation and voice acting here were better, maybe it would be up to that standard. The best thing that can be said about it is that the writers obviously bothered to actually read some Archie comics, so that the characters at least somewhat resemble the personalities that readers of the comics are familiar with. The quality of the individual episodes' plots vary somewhat, but the better ones (such as the few that focus on Veronica as a main character) actually manage to get the characters' dynamics right. In fact, I'd say a fair number of the episodes were better plotted and written than many of the issues of the comic book series spawned from the show, and on average it's no more badly-plotted or written than something like ARCHIE'S EXPLORERS OF THE UNKNOWN or JUGHEAD'S TIME POLICE, to mention a couple of "atypical" Archie series which it might be comparable to. I guess we could still wish for a show that was closer to a mainstream classic Archie series, but for what it is, it's okay. I just wish the acting was a little less hokey-sounding and that they had bothered to model the characters more closely on their comic book appearance. Oh, and if I recall correctly, I think I spent about $8 (new/sealed) for the set, so I guess I can say that I about got my money's worth at least. I plan to watch last espoide of Riverdale tomorrow. I'm watching Archie's Weird Mysteries - Cinemadness. I'm watching it on my IPod Classic.